A total of 299 women have served as U.S. representatives or senators since 1917, when Jeannette Rankin of Montana was elected as the first woman to serve in Congress.7 And this month, a record 104 women were sworn in as members of the 114th Congress. 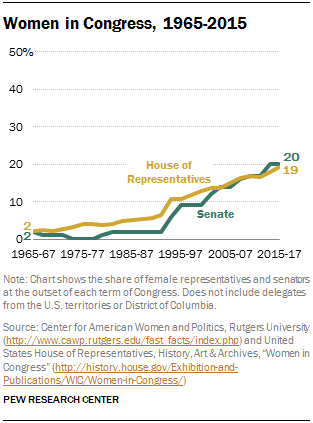 Yet, while the share of women serving in Congress has risen steadily for more than two decades, women remain heavily outnumbered in both the House and the Senate. 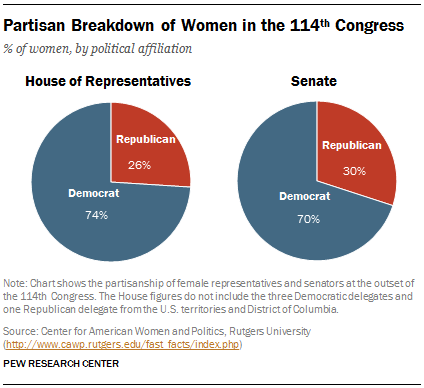 Women also make up a growing share of state-level elected officials. 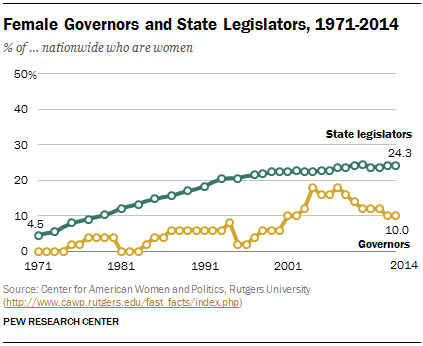 The share of state legislators who are women has risen from 4.5% in 1971 to 24.2% in 2015. The number of female governors has also increased, although not at a steady rate. Today five women are serving as governors. This is down from a peak of nine in 2007 and 2004. As of 2015, a total of 36 women (21 Democrats and 15 Republicans) have served as governors in 27 states. In addition, one woman has served as governor in Puerto Rico. Compared with their representation in the political realm, women have made only modest progress in gaining top leadership positions in the business world. 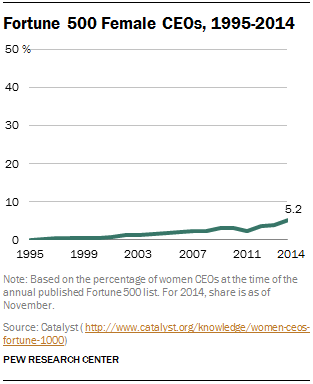 Today, 26 women are serving as CEOs of Fortune 500 companies (5.2%). The share serving as CEOs of Fortune 1000 companies is virtually the same (5.4%). Even though the corporate world is still mainly a man’s world, women have made inroads in this area slowly over time. 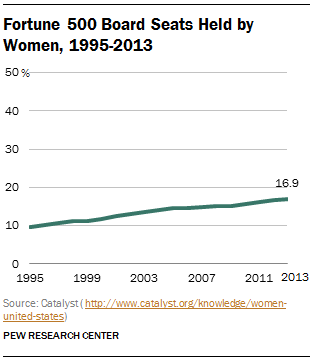 Just 20 years ago, there were no female CEOs of Fortune 500 companies. At the same time, young women are more likely than young men to graduate from college nowadays. Since the 1990s, women have outnumbered men in both college enrollment and college completion rates, reversing a trend that lasted through the 1960s and ’70s. By 2013, 37% of women ages 25 to 29 had at least a bachelor’s degree, compared with 30% of men in the same age range. Despite all the progress women have made in educational settings and the workplace, a gender wage gap persists. In 2012, the median hourly earnings for female workers 16 and older were 84% of men’s earnings. The gap is much smaller among young workers ages 25 to 34; women in this age group made about 93% of what men in this age group made. In 1980, the median hourly earnings for young women were 67% as much as young men were paid; and earnings of all employed women were 64% as much as all employed men received.